This my review of Xenosaga. Be warned! If you steal it, I'll go vigilante on your...but who would steal it? Xenosaga, from Namco, is somewhat of a spiritual sequel to Square-Enix's title, Xenogears. 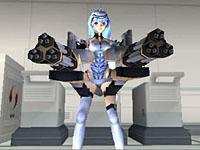 Xenosaga: Episode One is also only the first installment in a six game arc. STORY: The game takes place during a conflict in which the alliance of some 1500 planets are at war with disturbing spatial monsters known only as the Gnosis. The story quickly evolves from there into a conspiracy of galactic proportions, where the peace of the Alliance is at stake. From the warship Woglinde to the planet of Miltia, the game takes you many places. An excellent storyline that goes on par with Xenogears itself. GRAPHICS: the graphics are superb, leaving a lasting impression on the gamer. The character models are excellent, you can feel their emotions. Watching them makes the cutscenes all the more entertaining. GAMEPLAY: the game itself, when you actually are allowed to play, is actually amazingly fun. From poker and slots at the casino to card games online, the game gives you a lot to do with your spare time. The game also gives you quite a few opportunities to explore. Considering the game's chaotic nature, there would of course be some places that you couldn't return to. So the game gives you the chance to do it online, via virtual reality. All in all, a pleasing experience. Overall, Xenosaga is an excellent game with only a handful of shortcomings. Little gameplay time, short game length, and a sometimes confusing storyline are its biggest flaws. With the other five installments coming out shortly, Xenosaga should make a hardy impact on the RPG world.